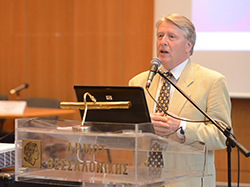 SPERI co-organised two Events|News in Thessaloniki in Greece this week in conjunction with The South-East Europe Research Centre (SEERC), the research hub of City College, Thessaloniki, which is the International Faculty of the University of Sheffield. The first event, which took place on Wednesday 9 September, was an authors’ workshop bringing together the research team that for the past two years has been researching under SPERI’s auspices the political economy of the crisis in Southern Europe. Its focus has been a comparative analysis of the crises in Greece, Spain and Turkey, which have similarities as well, of course, as differences. The various members of the research team presented their findings and the team took stock of the work that has been done. The next and final stage of the project will be to prepare the research for publication. 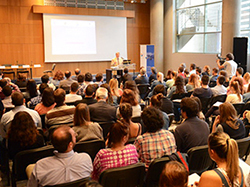 The second event, which took place in the City Hall, Thessaloniki, with the support of the Mayor, was a public event designed to present this research to the students and people of Thessaloniki, Greece’s second city. SPERI’s Co-Director, Professor Tony Payne, delivered the keynote talk entitled ‘Neoliberalism in the Age of Great Uncertainty’. After that, a panel discussed the Greek crisis. Speakers were Dimitris Tsarouhas (Bilkent University, Ankara), Alexandra Prodromidou (Associate Fellow, SPERI, and City College) and Pavlos Gkasis (also Associate Fellow, SPERI, and City College). A final panel then considered comparative crises in Spain and Turkey, with the speakers comprising Monica Clua Lusada (Pompeu Fabra University, Barcelona), Sadik Unay (SETA, Istanbul) and Owen Parker (Associate Fellow, SPERI, and Department of Politics, University of Sheffield). The meeting was very well attended and generated some lively exchanges, especially in the light of the fact that it was held just ten days before Greece’s latest election. Read Sadik Unai’s report of the event in a column published in the Daily Sabah: ‘The Age of Great Uncertainty‘. Watch Professor Tony Payne speaking on the Greek Financial Crisis and the upcoming British referendum on EU membership on Greek television.